Abraham Shakespeare (42) won $31 million dollars in the Florida Lottery in 2006. He took a lump sum payout of approximately $17 million. 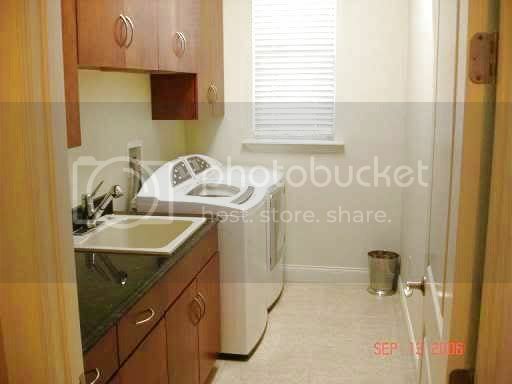 He remained a frugal person as he had before his lottery windfall, but after numerous failed real estate transactions, loans, and friendships Abraham has suddenly gone missing. He was last seen in the Lakeland area in April 2009. Dorice Emma Donegan Moore (AKA Dee Dee Moore) stated in the media that she bought out Abraham's debts to enable him to move away to escape paying child support arrears for a second child that was born after the lottery windfall. Law Enforcement believes there may be more to this story. There's a $10,000 REWARD for information to locate Abraham Shakespeare. 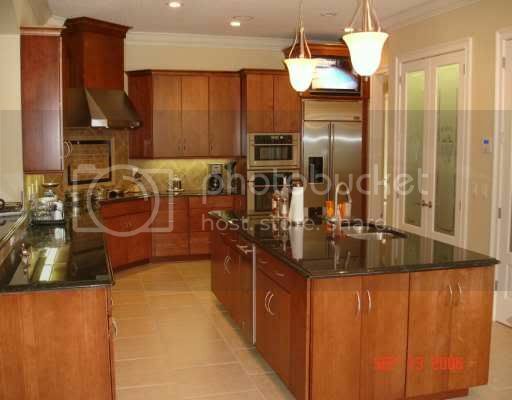 (Barbara Jackson, Millenmium Realty Center) "ML#L4596581 $1,100,000, Beds: 4, Full Baths: 3, Half Baths: 2, Pool (Home), Sq Ft Heated: 4646, Year Built: 2006"
Type: DEED, File No. 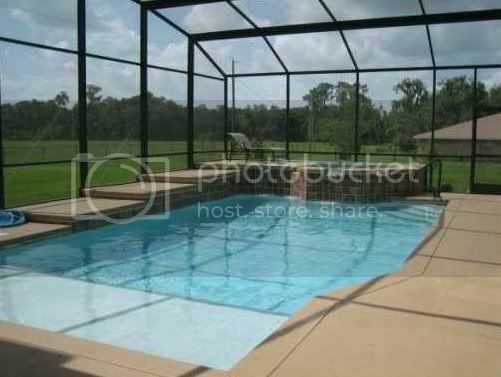 : 2007016788, Date/Time: 1/23/2007 16:10:23, Book Type: O, Book/Page: 7146/1750, Pages: 1, Consideration: $1,075,000.00, Legal: REDHAWK BEND TR A LT 5, Grantors: HINKLEY RONALD L JR, Grantees: SHAKESPEARE ABRAHAM L.
Page 1 EXCERPTS FROM THE DOCUMENT: "This legal document reflects that a construction lien has been placed on the real property listed herein, unless the owner of such property takes action to shorten the time period, this lien may remain valid for one year from the date of recording, and shall expire and become null and void thereafter unless legal proceedings have been commenced to foreclosure or to discharge this lien." 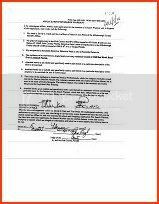 "CLAIM OF LIEN. 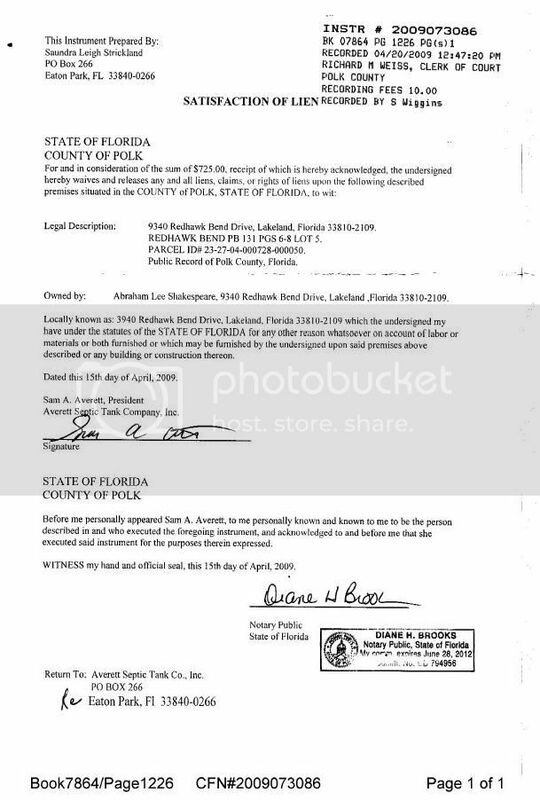 STATE OF FLORIDA, COUNTY OF POLK Before me, the undersigned Notary Public (Saundra Leigh Strickland), personally appeared Sam A. Averett, who was duly sworn and says that he/she is (the lienor herein) President of Averett Septic Tank Co., Inc. whose address is PO Box 266, Eaton Park, Florida, 33840-0266 and that in accordance with a contract with: Abraham Lee Shakespeare. 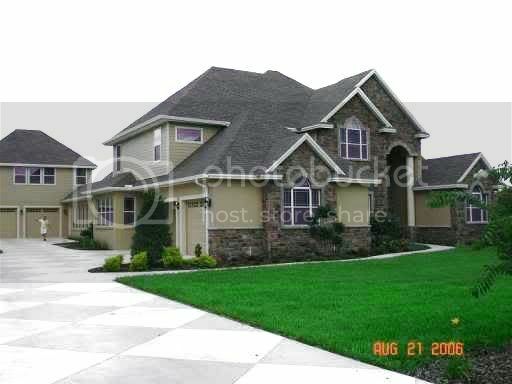 Lienor furnished labor, services, or materials consisting of: Hoot Aerobic Septic System Maintenance and Polk County Operating permit for the following described real property in Polk County, State of Florda: 9340 Redhawk Bend Drive, Lakeland, Florida 33810, PARCEL ID# 23-27-04-000728-000050. 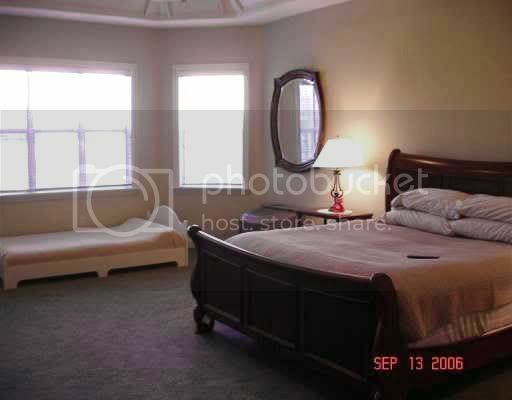 Owned by: Abraham Lee Shakespeare which remains unpaid $725.00 and furnished the first of the items on 09/12/2007 and the last of the items on 03/07/2008. Signed this 30th day of April, 2008." 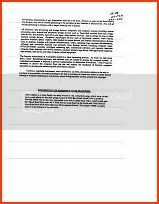 American Medical Professionals PEO Inc.
"This document Prepared by and Return to: Johnnie B. Byrd, Jr., Byrd & Stitzel., P.A., 206 North Collins Street, Plant City, FL 33563 (813) 759-1224"
EXCERPT FROM THE DOCUMENT: ["This document Prepared by and Return to: Johnnie B. Byrd, Jr., Byrd & Stitzel., P.A., 206 North Collins Street, Plant City, FL 33563 (813) 759-1224"] "This Quitclaim Deed, made this 9th day of January, 2009, Between Abraham Lee Shakespeare, a single man of the County of Polk, State of Florida, grantor, and American Medical professionals PEO, Inc., a corporation existing under the laws of the State of Florida whose address is P.O. 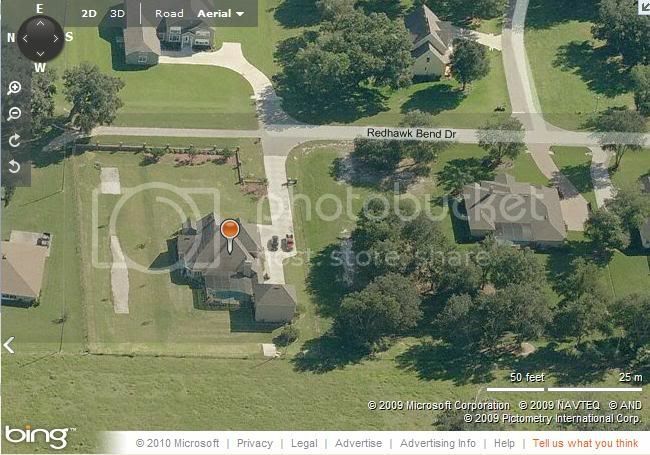 Box 433, Sydney, FL 33587 of the County of Hillsborough, State of Florida, grantee. Parcel Identification Number: 042723-000728-000050 & 042723-000728-000250 (Lot 5 and Tract A, Redhawk Bend according to the map or plat thereof recorded in Plat Book 131, Page 6, public records of Polk County, Florida. 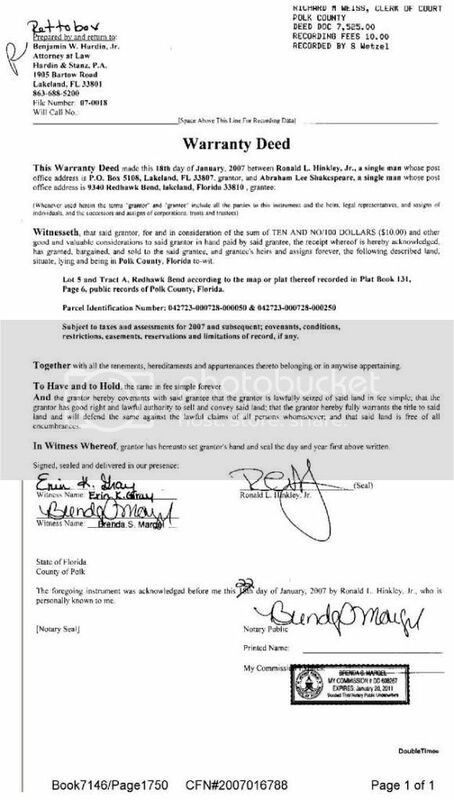 EXCERPT FROM THE DOCUMENT: "Signed, sealed and delivered in our presence: WITNESS: Jennie Gonzalez, WITNESS: Lori E. Collins. Abraham Lee Shakespeare signature (Abraham Lee Shakespeare, P.O. 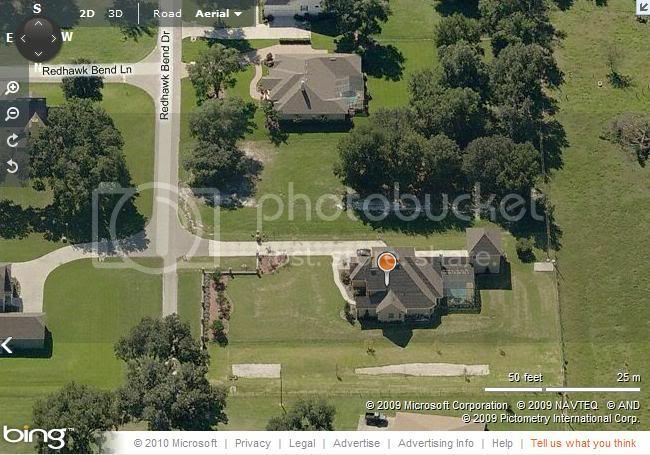 Address: 9340 Redhawk Bend Drive, Lakeland, FL 33810), [State of Florida, County of Polk, the foregoing instrument was acknowledged before me this 9th day of January, 2009 by Abraham Lee Shakespeare, a single man, he is personally known to me or has produced his "Florida driver's license as identification" (Typed in). NOTARY: Lori E. Collins." 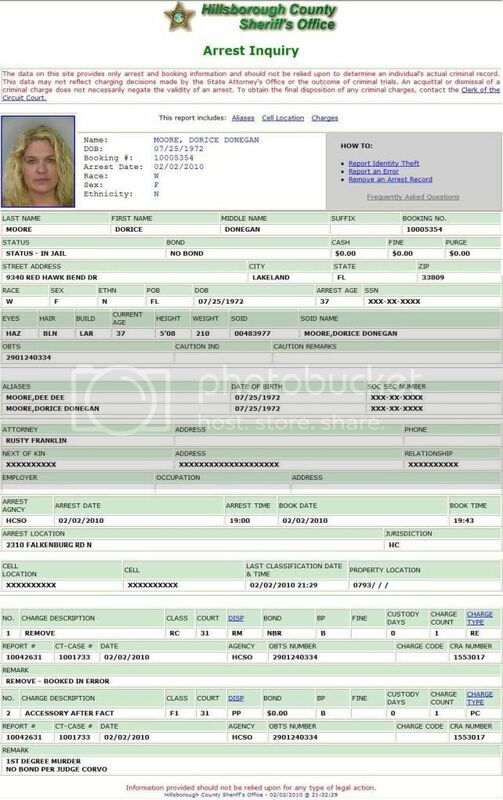 (Notary ID: 626379 Name: Lori E Collins, DOB: 11/28/63, Trans Type: REN, Cert: DD 814721, Status: ACT, Issuee: 11/01/08, Expires: 10/31/12, Bonding Agency: Huckleberry Notary Bonding, Inc., Mailing Address: 206 N Collins Street, Plant City, FL 33563)"
Page 1 EXCERPTS FROM THE DOCUMENT: "SATISFACTION OF LIEN. 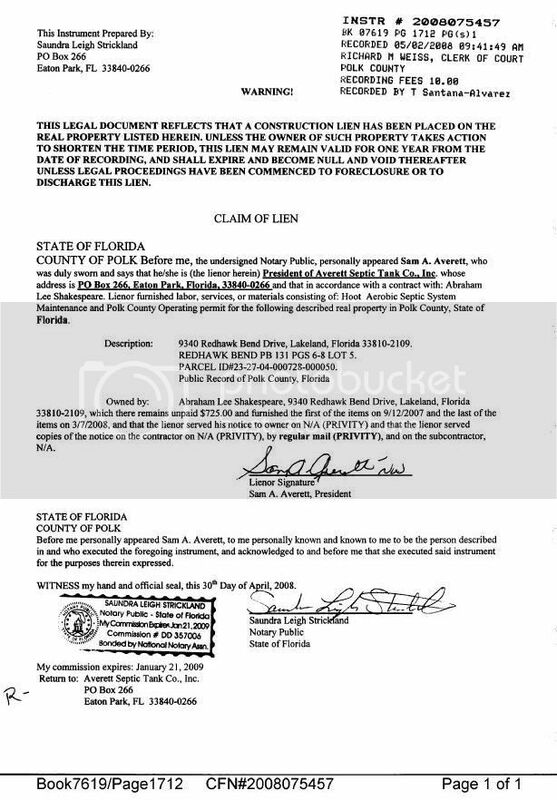 STATE OF FLORIDA, COUNTY OF POLK, For and in consideration of the sum of $725.00, receipt of which is hereby acknowledged, the undersigned hereby waives and releases any and all liens, claims, or rights of liens upon the following described premises situated in the COUNTY OF POLK, STATE OF FLORIDA, to wit: 9340 Redhawk Bend Drive, Lakeland, Florida 33810, PARCEL ID# 23-27-04-000728-000050. Owned by: Abraham Lee Shakespeare. Date: 15th day of April, 2009, Sam A. Averett , President, Averett Septic Tank Company, Inc."
[www2.tbo.com] By JENNIFER LEIGH, News Channel 8 and JOSH POLTILOVE, The Tampa Tribune, Published: January 29, 2010, Updated: 04:14 pm, "Not long after Shakespeare bought a million-dollar home in early 2007, he was approached by Moore, said family and officials. Moore she was interested in writing a book about Shakespeare's life and became something of a financial adviser to Shakespeare, who never graduated high school. Moore moved more than $1 million from Shakespeare's bank accounts into her own after he was last seen, Polk County deputies say." "Deputies said Moore used Shakespeare's cell phone to send text messages to his family and friends — after he was last seen in April — to make it appear he was alive. She paid one of his cousins $5,000 to hand-deliver a birthday card — with cash — to Shakespeare's mother. She also offered to turn over a house worth $200,000 to someone if that person would make a false statement to law enforcement that they saw Shakespeare alive, investigators said." [abcnews.go.com] By SARAH NETTER and EMILY FRIEDMAN, Jan. 29, 2010, "Police Warn That Person of Interest in Shakespeare Case Is a 'Con Artist'. Judd had some harsh words for Moore, who told the Florida newspaper The Ledger last year that her house had been searched and she was being questioned, even though she had only tried to help him flee a life that had gotten only more complicated ever since he won $31 million on a 2007 winning ticket. She told the paper that Shakespeare had "planned on running" and that he had "planned on not coming back." She said the lottery winner was "tired of fighting child-support battles in court" and was sick of people "badgering him for money." [www.myfoxorlando.com] Updated: Friday, 29 Jan 2010, 11:19 PM EST Published : Friday, 29 Jan 2010, 3:05 PM EST, "On Dec. 5, Moore told The Lakeland Ledger that she helped Shakespeare disappear, but now wants him to return because detectives were searching her home and car and looking for blood on her belongings." "Right now investigators aren't saying where Moore is but FOX 35 stopped by her house. 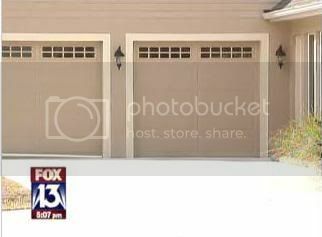 A neighbor told a news crew off camera that she saw Moore's truck in the driveway earlier Friday and several times this week, but that a moving truck had been spotted in the early morning hours. 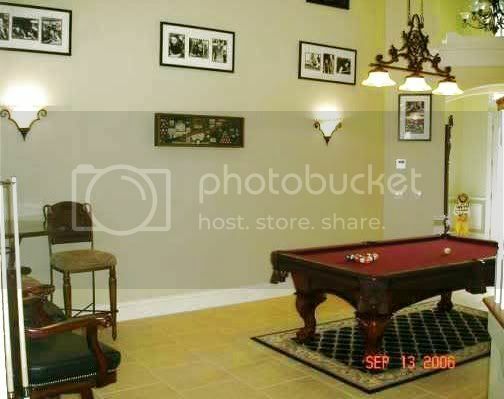 Moore lives in a Lakeland mansion formerly owned by Shakespeare. He signed it over to Moore last spring when thinking about moving out of town. 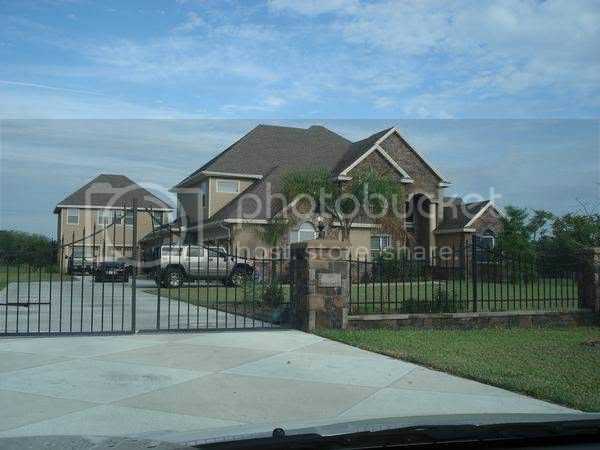 Witnesses said Moore's driveway is typically filled fancy, cars, motorcycles, and boat but now it sits empty." [www.theledger.com] By Merissa Green, Published: Monday, February 1, 2010 at 11:31 p.m., Last Modified: Monday, February 1, 2010 at 11:31 p.m., "I would never hurt anyone in my life,” Moore said. “I'm truly sorry to Shakespeare's family and friends. My heart goes out to them.” She would not answer questions about whether a gun is involved and she said there are witnesses to what happened. Moore said she has told investigators who pulled the trigger and there will be others who will be arrested, too." "I know what I've done,” Moore said. “I'm not worried. I didn't need to steal from him; he would do whatever I wanted.” Moore said Shakespeare's death was a result of him being robbed by someone else. She said she had good reason for not coming forward sooner but would not give any specific details." 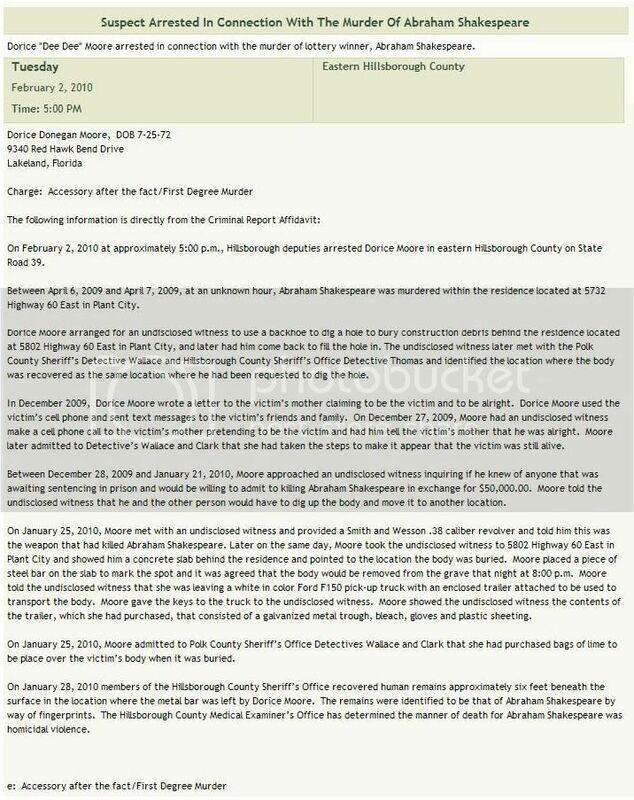 [www2.tbo.com] TBO.com, Published: February 2, 2010, "Moore proclaimed her innocence while speaking to the media gathered outside her home this afternoon. She said investigators told her Shakespeare had been shot." "Moore said she wants to go to Shakespeare's funeral Saturday but is waiting to find out whether that would be too upsetting to his friends. She said the media coverage is ruining her neighbors' lives and asked reporters why they don't focus on more important topics, such as sinkholes." - She said Officer Troy Young video taped her going into the safe deposit box, NO cash, 2 pieces of paper. - She wrote finance book called "Organize Me Now." It wasn't published but says it is copyrighted. 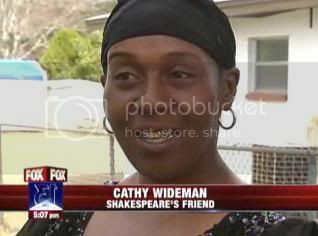 "She knew Shakespeare was shot in the head"
[www.wesh.com] POSTED: 2:39 pm EST February 2, 2010, UPDATED: 10:10 pm EST February 3, 2010, "Moore spoke outside the home she bought from Shakespeare. She spoke about Shakespeare's lottery winnings and the negative effect she believes they had on his life. "The money was like a curse to him, and it's become a curse to me," Moore said." - "Moore admitted she knew more information than she could tell reporters but did say she knew Shakespeare was shot in the head." "Don't any of you think about his family? It shouldn't be about me. It should be about him. A man has died and is finally getting a proper funeral. He did not deserve to buried in a back yard like a piece of trash," Moore said." 2010-02-02 "I didn't kill the man," she said. "I would never pull a gun on another human being in my life." "I'm not scared of going to jail for murder because there is no jury that would convict me," she said." "I never did anything unethically or unprofessionally, or anything that he didn’t want done," Moore said"
[www.myfoxtampabay.com] Updated: Tuesday, 02 Feb 2010, 3:43 PM EST, Published : Tuesday, 02 Feb 2010, 2:12 PM EST, "The woman at the center of the murdered millionaire case says she's not the one who killed Abraham Shakespeare; instead, she feels like she's being railroaded." "Moore says she has spoken to investigators and told them her side of the story. She wouldn't discuss many details of the case because of the ongoing investigation. "The sheriff's department knows the situation I went through, and what I have been through," Moore said." "Moore talked to reporters this afternoon for almost 30 minutes and denied killing Shakespeare. She said she could never do such a thing to another human being, and even said she had asked for permission to go to his funeral." "Let the courts be the judge of that, let the investigators do their jobs, and they'll bring justice to the right person." [www.baynews9.com 02/02/2010], POLK COUNTY (Bay News 9) -- "The person of interest in a homicide case involving the Polk County lottery winner has been arrested. 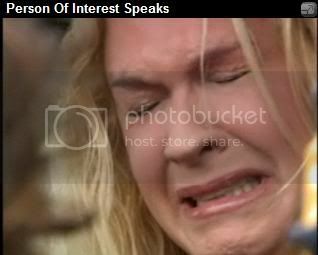 In her first televised interview, Moore told Bay News 9 that she did not kill Shakespeare. "Let the courts be the judge of that, let the investigators do their jobs, and they'll bring justice to the right person," she said. In an earlier interview with Bay News 9's partner paper, the Ledger, Moore had said she knew who killed Shakespeare. However, her new attorney said she can no longer comment on specifics of the case. She refused to comment on her earlier statement. "I would be glad to talk to all of you, tell you the complete story," she said. "But my lawyer says I cannot comment on anything." 2010-02-02 "I am concerned that I have not heard from my client in two hours," said Lakeland attorney John Liguori." 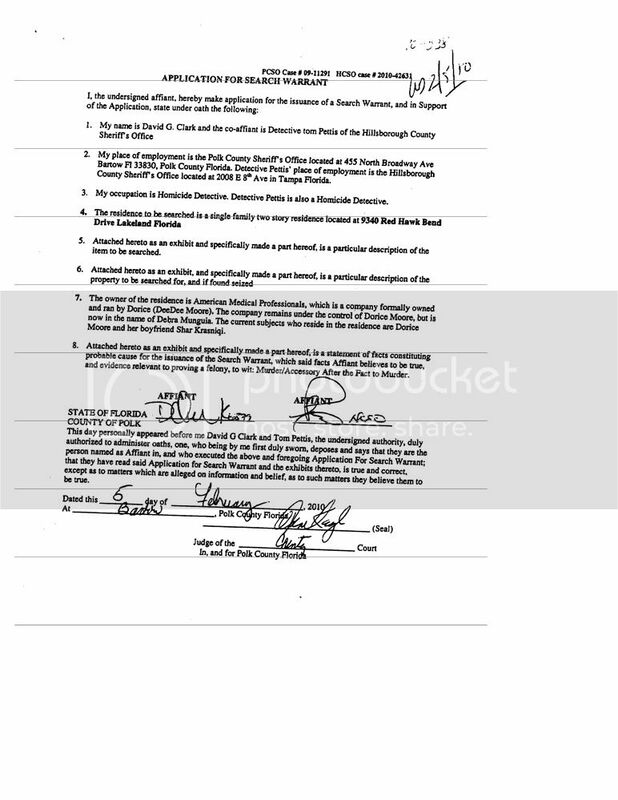 [www2.tbo.com] TBO.com, Published: February 2, 2010, "The lawyer for Dorice Donegan "Dee Dee" Moore has told the Hillsborough County Sheriff's Office his client is not to be questioned about the disappearance and murder of Lottery millionaire Abraham Shakespeare. "I am concerned that I have not heard from my client in two hours," said Lakeland attorney John Liguori. Liguori said he does not know if she has been arrested, but is concerned because he has not heard from her in so long." "Investigators haven't said how Shakespeare was killed, but Moore said he was shot. She wouldn't say who killed him." - "She said she has spoken with some of his relatives. "They know that I'm very saddened, I'm very upset, and I don't have any tears left," she said." - On February 2, 2010 at approximately 5:00 p.m., Hillsborough deputies arrested Dorice Moore in eastern Hillsborough County on State Road 39. 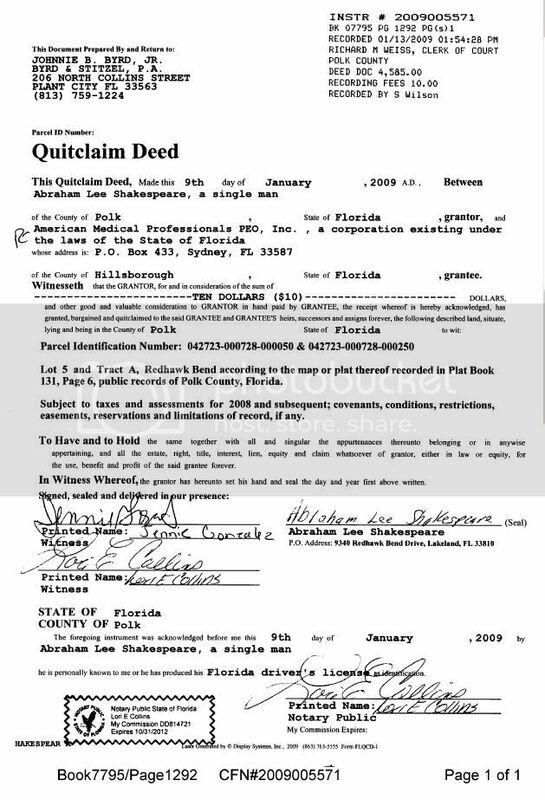 - Between April 6, 2009 and April 7, 2009, at an unknown hour, Abraham Shakespeare was murdered within the residence located at 5732 Highway 60 East in Plant City. - Dorice Moore arranged for an undisclosed witness to use a backhoe to dig a hole to bury construction debris behind the residence located at 5802 Highway 60 East in Plant City, and later had him come back to fill the hole in. The undisclosed witness later met with the Polk County Sheriff’s Detective Wallace and Hillsborough County Sheriff’s Office Detective Thomas and identified the location where the body was recovered as the same location where he had been requested to dig the hole. 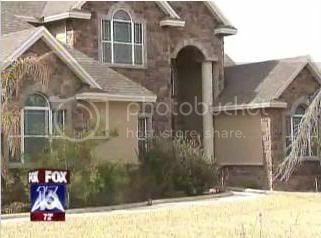 2010-02-02 "Sheriff's are executing a search warrant on the two story home where the body was found simultaneous to the news conference." "Authorities believe Abraham was murdered in the single story ranch house next door"
"A gun believed to be used to shoot Abraham has been recovered"
"It is still possible that Moore could be charged with murder. The investigation is not complete and it is likely Moore will be charged with other crimes." - At 5:00 pm tonight DeeDee Moore was arrested on Highway 39 and charged with Accessory After the Fact Related to 1st Degree Murder. 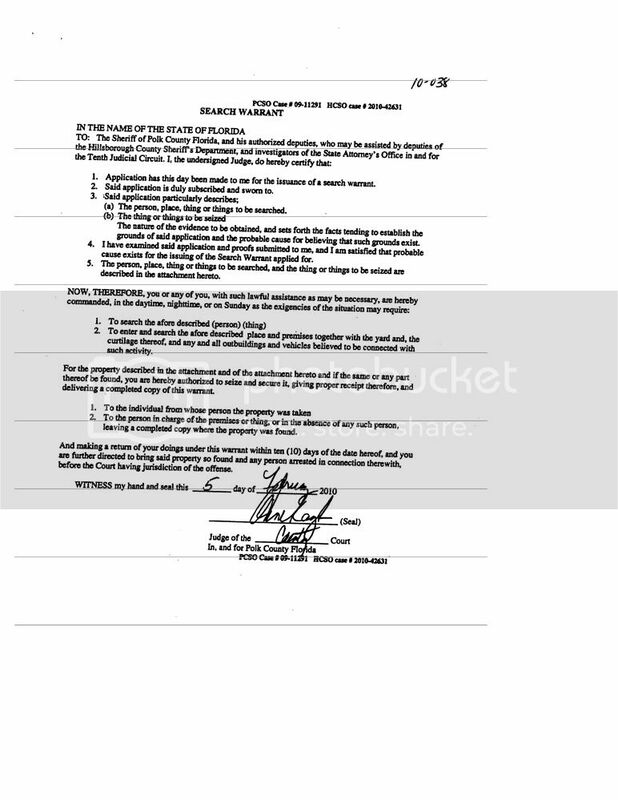 - Probable cause affidavit: Authorities believe on April 6 or April 7, 2009 Abraham was murdered. Moore hired an accomplice to use a backhoe to dig the hole for burial. During 2009 Moore used numerous methods to create the illusion Abraham was still alive including false phone calls from his phone and sending cards to his mother. 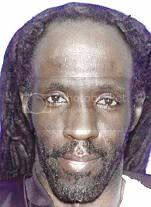 - Moore inquired if anyone knew of someone due to report to prison who would be willing to confess to killing Abraham. She offered $50,000 in exchanged for the confession. - A gun believed to be used to shoot Abraham has been recovered. - Shortly before authorities obtained the search warrant to search the concrete slab, Moore hired an accomplice to removed Abraham's body from the location where authorities eventually found it. She instructed the accomplice to dig up the concrete where she had placed a mark, remove the body, and place it on a trailer she provided. Moore admitted to police she purchased lime to put over the body. - Sheriff's are executing a search warrant on the two story home where the body was found simultaneous to the news conference. Authorities believe Abraham was murdered in the single story ranch house next door. 2. My place of employment is the Polk County Sheriff's Office located at 455 North Broadway Ave Bartow Fl 33830, Polk County Florida, Detective Pettis' place of employment is the Hillsborough County Sheriff's Office located at 2008 E 8th Ave in Tampa Florida. 3. My occupation is Homicide Detective. Detective Pettis is also a Homicide Detective. 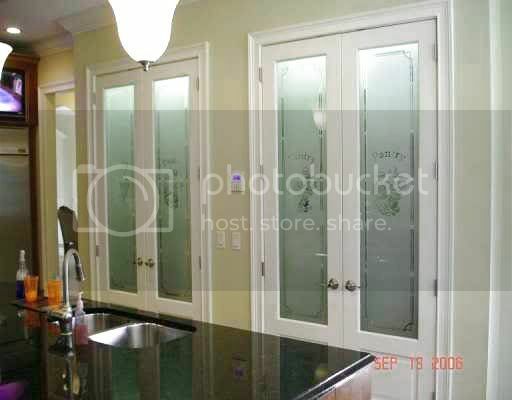 7.The owner of the residence is American Medical Professionals, which is a company formally owned and ran by Dorice (DeeDee Moore). The company remains under the control of Dorice Moore, but is now in the name of Debra Munguia. 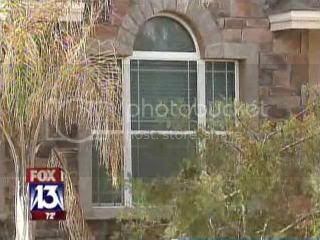 The current subjects who reside in the residence are Dorice Moore and her boyfriend Shar Krasniqi. "All business and personal financial records, including but not limited to, tax returns, bank statements, investment statements, Form 1040, Form 1099, Form 1098, Schedule C, Form 1120 or 1120S, canceled checks, check listings, checking accounts, cash transactions, registers, deposit information, invoices, bills, statements, contracts, bids, correspondence, spreadsheets, financial statements, files, utilizing financial software including but not limited to Peachtree, Quicken, Quickbooks, or Microsoft Money, Turbo Tax, , Tax Cut, minutes, budgets, and documents involving expenditures, funding and support related to Abraham Shakespeare, Dorice (Dee Dee) Moore, Shar Anthony Krasniqi, Howard Stitzel, Judith Haggins, Shakespeare & Associates LLC, Abraham Shakespeare LLC, American Medical Professionals LLC, ASTAT and Supplies LLC, American Medical Professionals PEO, Inc., including but not limited to receipt books, financial records, binder books. 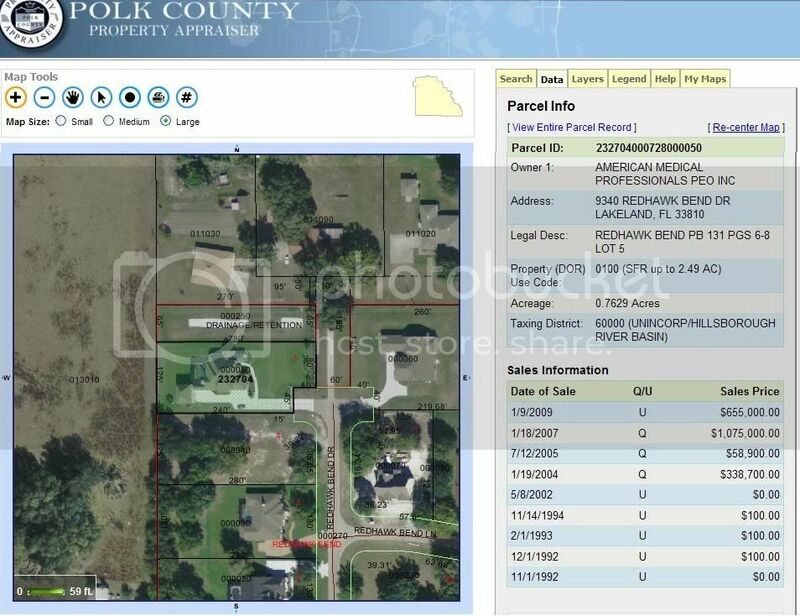 All records pertaining to real properties owned, rented, or financed by any of the above named individuals or entities including but not limited deeds, contracts, mortgages, liens, assignment of mortgages, payment records, appraisals, settlement statements, closing documents, or other documentation related to those properties. 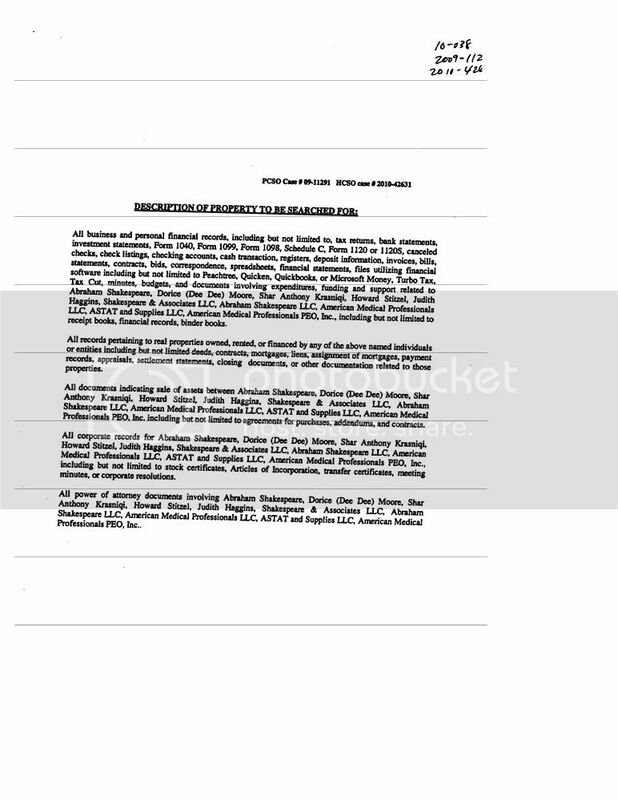 All documents indicating sale of assets between Abraham Shakespeare, Dorice (Dee Dee) Moore, Shar Anthony Krasniqi, Howard Stitzel, Judith Haggins, Shakespeare & Associates LLC, Abraham Shakespeare LLC, American Medical Professionals LLC, ASTAT and Supplies LLC, American Medical Professionals PEO, Inc., including but not limited to agreements for purchases, addendums, and contracts. All corporate records for Abraham Shakespeare, Dorice (Dee Dee) Moore, Shar Anthony Krasniqi, Howard Stitzel, Judith Haggins, Shakespeare & Associates LLC, Abraham Shakespeare LLC, American Medical Professionals LLC, ASTAT and Supplies LLC, American Medical Professionals PEO, Inc., including but not limited to stock certificates, Articles of Incorporation, transfer certificates, meeting minutes, or corporate resolutions. All power of attorney documents involving Abraham Shakespeare, Dorice (Dee Dee) Moore, Shar Anthony Krasniqi, Howard Stitzel, Judith Haggins, Shakespeare & Associates LLC, Abraham Shakespeare LLC, American Medical Professionals LLC, ASTAT and Supplies LLC, American Medical Professionals PEO, Inc."
"All firearms, ammunitions or any instruments believed to be from a firearm or assist in the functionality of a firearm. 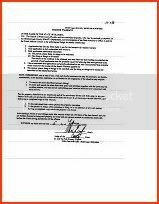 Any and all records pertaining to the purchase of any firearms or ammunitions. Any and all records pertaining to training with or target shooting with a firearm. All electronic data processing and storage devices, computers and computer systems including central processing units, internal and peripheral storage devices such as fixed disk, floppy disk drivers, and diskettes, tape drives and tapes, flash memory devices, optical storage devices or other memory storage devices. 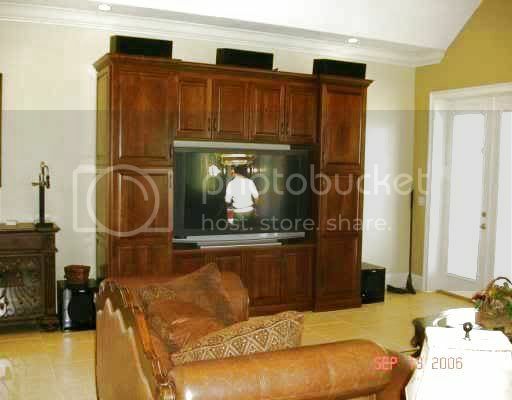 Peripheral input/output devices such as keyboards, printers, video display monitors, scanners, optical readers, video capture or output devices, and related communications devices such as modems, together with system documentation, cables, operating logs, assorted documentation software, and instruction manuals, and printouts. Data Backup devices including computer tapes, DVD/CD-ROMS, cassettes, cartridges, streaming tape, commercial software, and manuals, hardware computer disks, diskettes, disk drives, modems, computer printers, tape drives, disk application programs, tape systems, hard drives, and other computer related equipment. The forensic examination of a computer system is a time consuming process. An exam can take more than a week. Specialized hardware and software tools are needed to process the computer system. A controlled environment is required to prevent contamination or destruction of evidence. Thus it may by [sp] necessary to remove the computer from the site and employ the assistance of forensic computer specialists in securing and preserving data and evidence thereon. 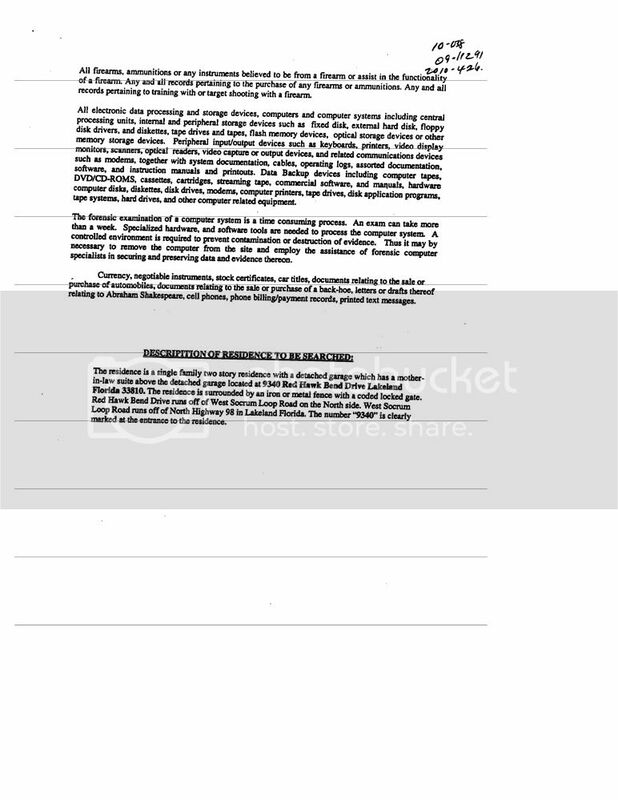 Currency, negotiable instruments, stock certificates, car titles, documents relating to the sale or purchase of automobiles, documents relating to the sale or purchase of a back-how, letters or drafts thereof relating to Abraham Shakespeare, cell phones, phone billing/payment records, printed text messages. 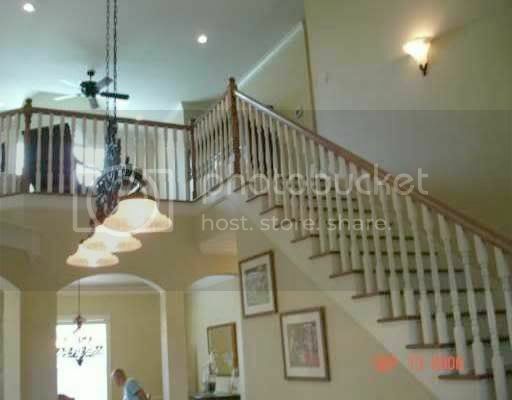 The residence is a single family two story residence with a detached garage which has a mother-in-law suite above the detached garage located at 9340 Red Hawk Bend Drive Lakeland Florida 33810. 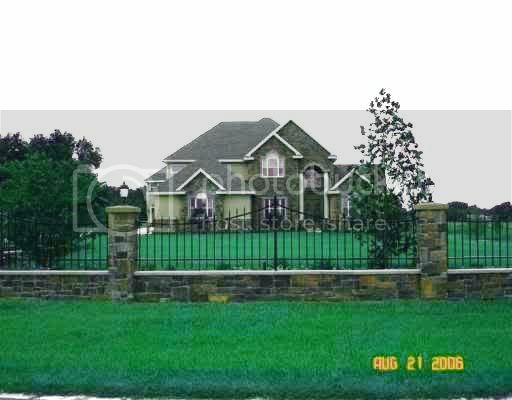 The residence is surrounded by an iron or metal fence with a coded locked gate. Red Hawk Bend Drive runs off of West Socrum Loop Road on the North side. West Socrum Loop Road runs off of North Highway 98 in Lakeland Florida. The number "9340" is clearly marked at the entrance to the residence"